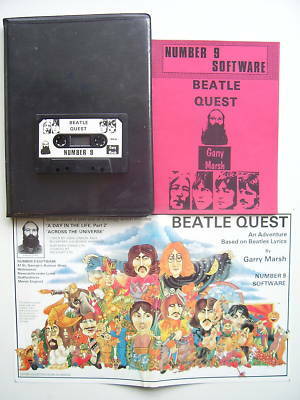 BEATLE QUEST is a complex text adventure game with over 150 locations, 200 messages and 60 objects etc. You will have to solve a number of puzzles and complete certain actions, whilst collecting objects of interest and value. BEATLE QUEST may take you weeks or months to solve, but bear in mind that BEATLE QUEST is based on Beatle lyrics and whever possible, ''story lines'' of songs have been followed. ONLY ONE AROUND AT TIME OF LISTING!!!!! !